This guest post was developed and written by Al Edlund. Al is a fellow Microsoft Visio Most Valuable Professional (MVP), and is a networking expert, and a big fan of Visio. He’s also told me that networking is also his hobby, so when he’s working he’s playing, and when he’s playing he’s working! Thanks Al for another great effort! This Visual Studio 2010 project demonstrates a number of concepts that can be used in developing applications in support of Visio network diagrams. In this project we will make further use of the data model that we have been using in previous projects. For a brief introduction of the data model watch this video: MS Visio DC Rack Data and Visualization Strategy. 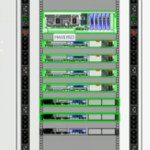 An overview of this project can be found over here: DC Rack Attribute Drill-down. The project has two external files included. 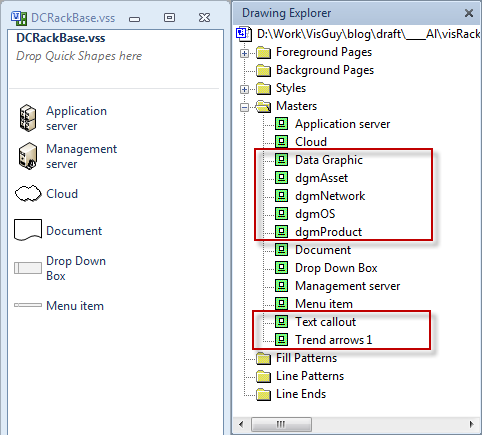 The two external files are a custom Visio stencil and an Excel workbook with sample data for the creation of the drawing. The sample data is saved in separate worksheets. 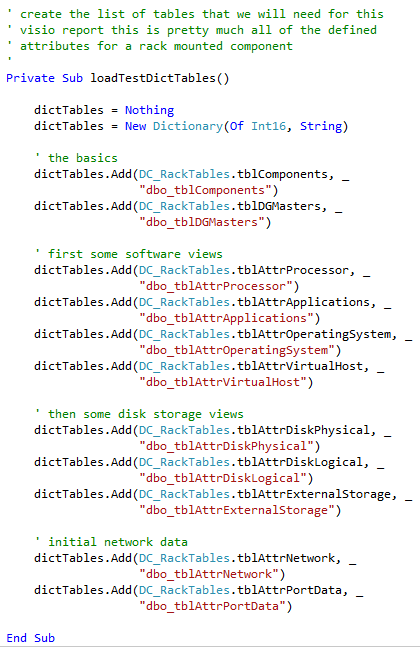 The Visio stencil file is called “DCRackBase.vss” and if you open it up, you will only see six masters. But it is important to note that this stencil also contains seven data graphic items that can only be seen in the Document Explorer. Data graphics are stored as a special type of master, not visible to the user in the stencil window. They do, of course show up in the Data Graphics list on the Data tab. Each of the worksheets will be imported as System.Data.Datatable structures which have had matching DataDefinition and DataAccess classes created. 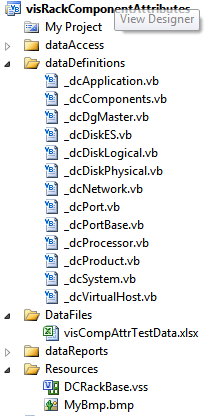 My personal preference is to not use the Visio DataRecordsets but the data cache class can save the converted data tables into the working document. 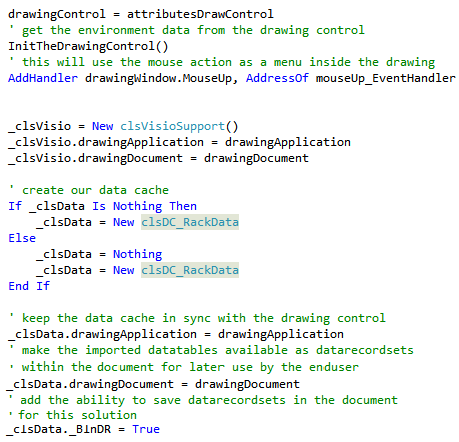 In this example we have flagged the class (_blnDR) to save the attribute data into the document. When the document is saved the user will be prompted whether to keep it or discard the DataRecordsets. One of the tables which the form imports is the tblDGMasters table. 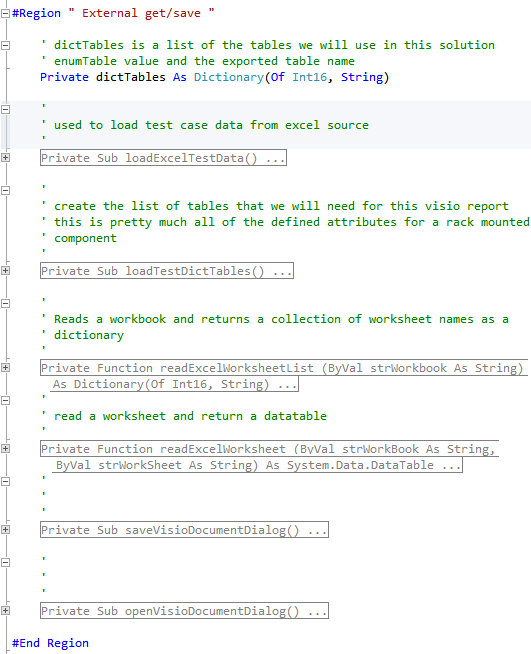 This table is one of two used in the full application that links Visio shapes and stencils to the creation of a working document (the other one is the tblProductData which is not included). 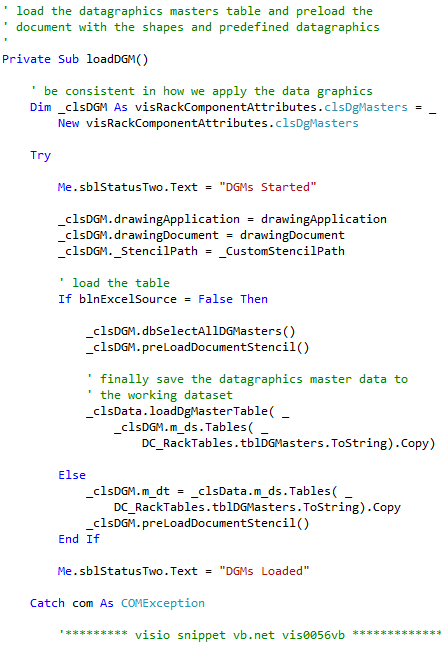 When we load these tables we have the option of ‘preloading’ the defined Visio masters and stencils into the application. This is done so that the needed masters will be placed into the drawing’s document stencil ahead of time. This will improve drawing performance later on, because masters won’t need to be copied from an external stencil into the document. The tblDGMasters table allows the developer to identify surrogate shapes and data graphic masters for each of attribute tables external to the application. 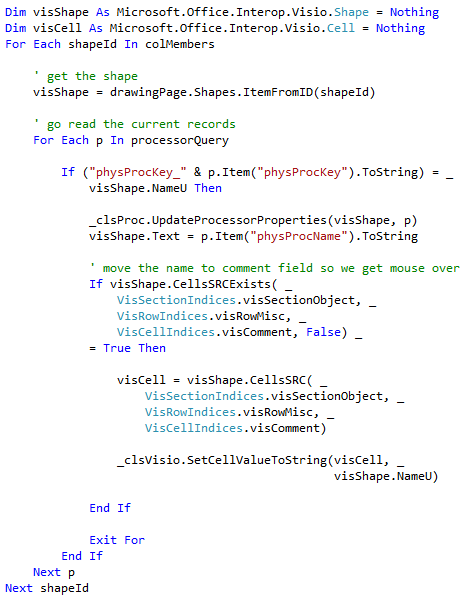 There are some VBA example code snippets in the Visio Guy discussion forum here: Using surrogate shapes for Data Graphics. Within this project we take advantage of it when we place the network attribute data on the page. click to view larger image The general flow for displaying the tables goes like this: First, we drop the container for the attribute set on the page. We pass it the master name, header, and shape name. Then we get a collection of record keys from the imported data table that can be used as shape names for list items that we will create. This is needed so that all of the shape names on the page are unique. 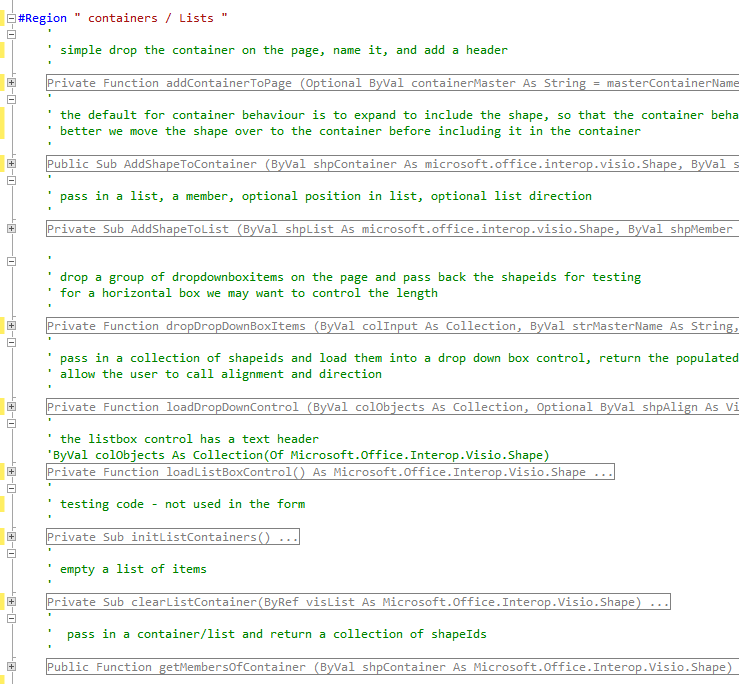 Next, pass the created collection of names to the routine that will drop ListBox items on the page. 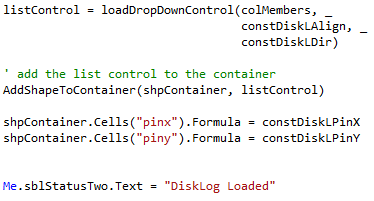 This is very similar to the DropMany method and returns a collection of shape IDs. We then apply to each of the dropped shapes a set of shape data properties that were predefined in the data access classes. 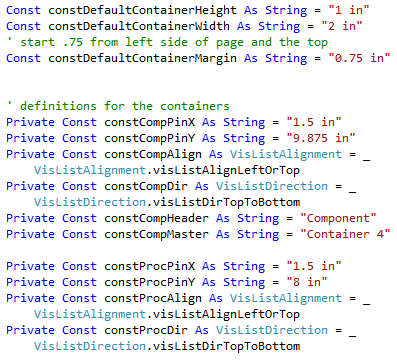 The thing to note about the adding shape to container is to move the shape in the vicinity of the container on the page so that when the shape is included the container size is somewhat rational. Hi – This is a great concept. When I downloaded the project however there is no frmVisioRack?